To celebrate Mario’s big five-oh, here is a look at his career, illustrated with some of his best cards. 1981-82 – Lemieux played his first of three seasons of junior hockey with the Laval Voisins of the QMJHL. As a rookie, he leads the team in scoring with 30 goals and 66 assists in 64 games. 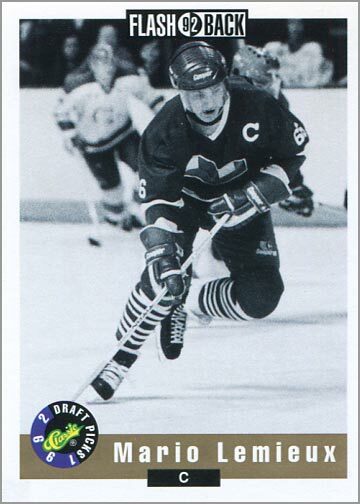 1982-83 – In his second season of junior hockey, Lemeiux scored 184 points (84 G, 100 A,) in 66 games — 58 more points than teammate Claude Vilgrain, who was second in team scoring with 126 points in 69 games. 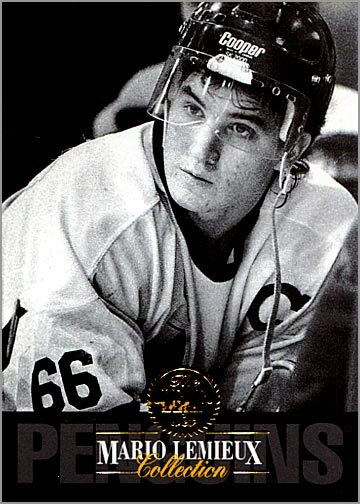 Lemieux also played for Team Canada in the 1983 World Junior Championships in Leningrad, Russia, and won a Bronze Medal. He scored five goals and five assists in the tournament. 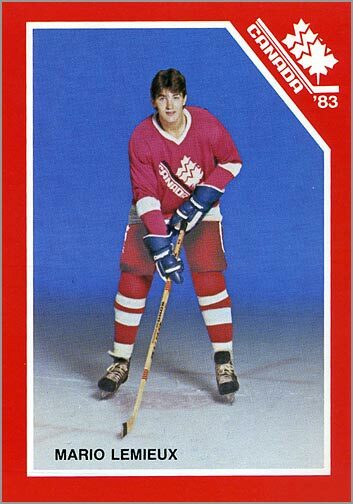 1983-84 – Lemieux had an amazing final year of junior hockey, as he scored 133 goals and 149 assists for 282 points in 70 games. Lemieux refused to play in the 1984 World Junior Championships because he did not want to miss any games with his junior team. In addition to setting new records for goals and points scored in the QMJHL, Lemieux was named the regular season MVP, the playoff MVP, the best pro prospect, and the Major Junior player of the year. 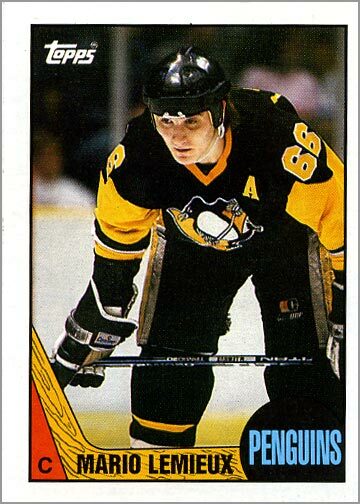 June 9, 1984 – The Pittsburgh Penguins, who may have tanked on purpose at the end of the season to ensure a last-place finish, draft Lemieux with the first overall pick. 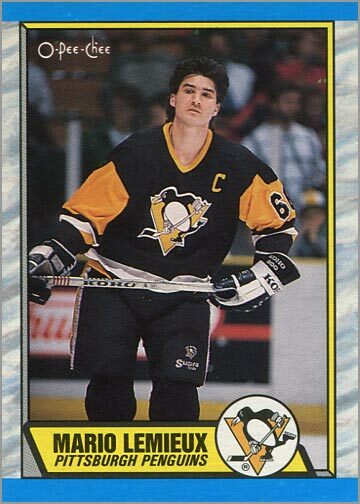 Lemieux and his agent could not work out a contract agreement with the Penguins prior to the draft (everyone knew Pittsburgh was going to take Lemieux). 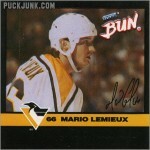 Thus, when the Pens drafted him, Lemieux did not shake hands with the team’s GM, nor did he don the Penguins’ jersey. 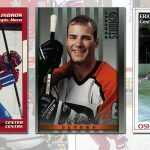 Seven years later, Eric Lindros would also refuse to put on the jersey when the Quebec Nordiques drafted him first overall. 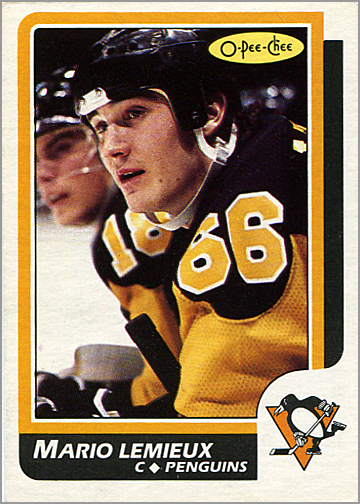 1985-86 – Unlike many other NHL players, Lemieux did not suffer from a Sophomore Slump. He scored 141 points in 79 games and won the Lester B. Pearson Award, as the league’s most outstanding player as voted by his peers. 1986-87 – Lemieux hit the 50-goal plateau for the first time in his career, as he scored 54 goals and 53 assists in 63 games. Summer 1987 – Lemieux played for Team Canada in the 1987 Canada Cup. In the best-of-three final series against the Soviet Union, Lemieux scored the game-winning goal in double overtime of game two. In the third and deciding game, Lemieux scored the game-winner in the final minute to lead Canada to the gold medal. 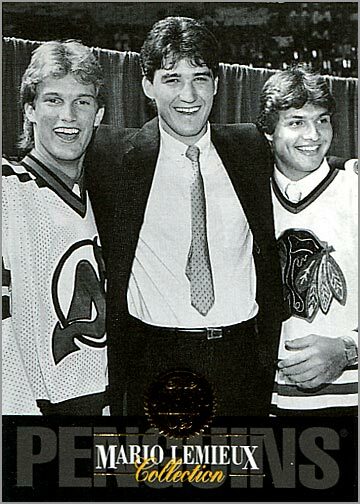 1987-88 – While the previous three years were nothing short of amazing, Lemieux managed to do the unthinkable in fourth year in the NHL: he scored more points than Wayne Gretzky. 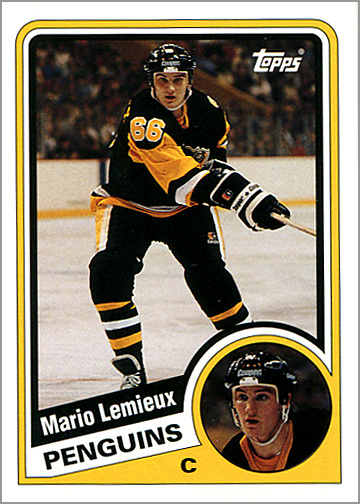 Lemieux’s 70 goals and 98 assists for 168 points broke Gretzky’s streak of seven consecutive Art Ross Trophies. He also won the Hart Trophy as league MVP — breaking Gretzky’s streak of eight consecutive Hart wins. He won his second Pearson Trophy, too. 1988-89 – For the second year in a row, Lemieux won the Art Ross Trophy when he put up a staggering 199 points (85 G, 144 A). Along the way, he scored 50 goals in 50 games and set a record with 13 shorthanded goals. 1989-90 – Lemieux had a 46-game point scoring streak during the 1989-90 season, just falling short of eclipsing Gretzky’s mark of 51 games. The streak might have been longer, but Lemieux injured his back.He finished the season with 123 points (45 G, 78 A) in just 59 games. 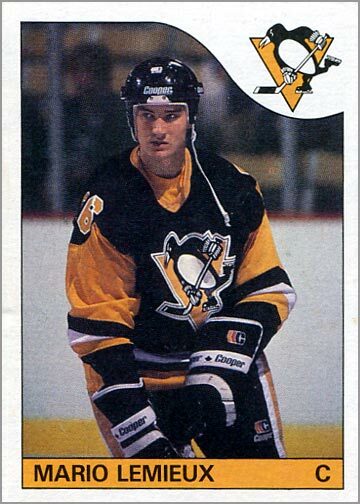 1990-91 – During the off season, Lemieux had back surgery to fix a herniated disc. He only played in 26 regular season games, but still scored 19 goals and 26 assists. 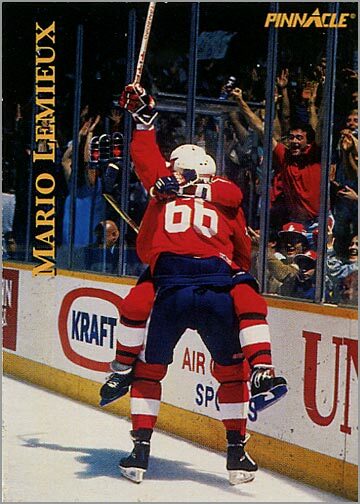 Then, in 23 playoff games, Lemiuex was nearly unstoppable. He scored 16 goals and 28 assists, leading the Penguins to their first Stanley Cup Championship. His scoring prowess netted him the Conn Smythe Trophy as the playoff MVP. Keep in mind that Lemieux was playing through back pain; he wore a back brace that season, but put up numbers better than most healthy players. 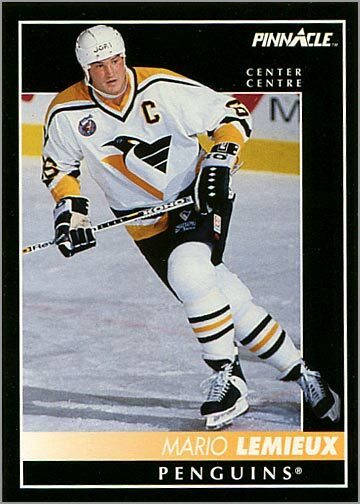 1991-92 – Lemieux won his third scoring title in 1991-92, as he scored 44 goals and 87 assists for 131 points in 64 games. He also led in playoff scoring with 16 goals and 18 assists for 34 points in just 15 games. He even missed five games with a broken hand, but still continued to dominate. 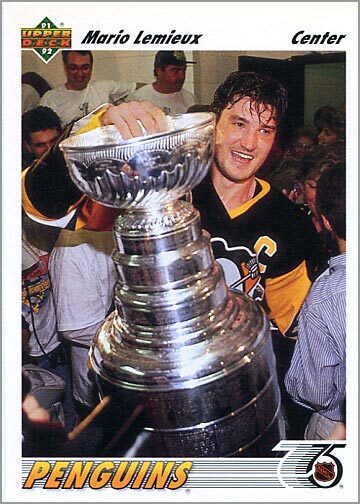 The Penguins won their second Stanley Cup that year, and Lemieux was again awarded the Conn Smythe. 1992-93 – Everything started well for Lemieux this year. He was on pace to break Gretzky’s record of 92 goals in a season. But then he was diagnosed with Hodgkin’s lymphoma, He missed 24 games and had to undergo radiation treatment. 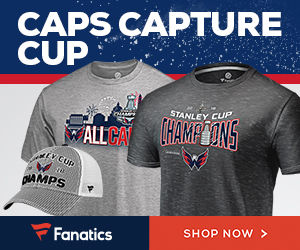 Despite that, he still won the scoring title by scoring 160 points (69 G, 91 A) in 60 games. He won Pearson Trophy a third time, and the Bill Masterton Trophy for his comeback. 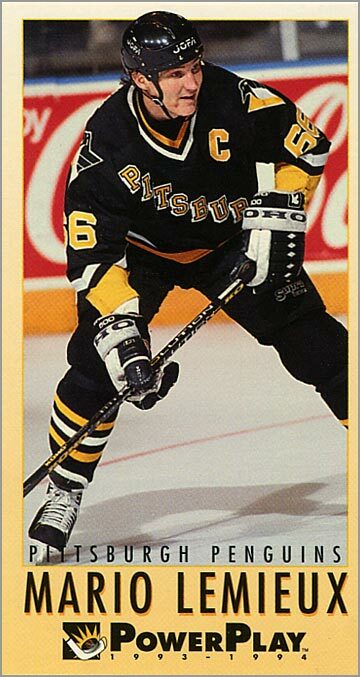 1993-94 – Back problems limited Lemieux to 22 games. Still, he netted 37 points in the regular season, and another 7 points in 6 postseason games. 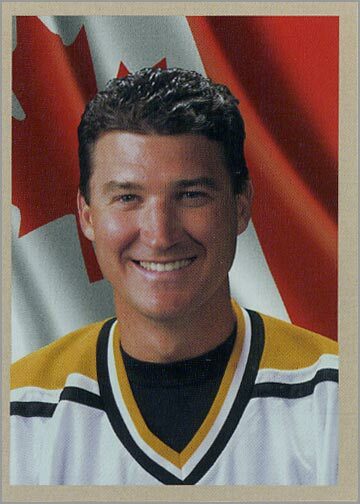 1994-95 – Lemieux sat out the lockout-shortened 1994-95 season due to chronic fatigue caused by his radiation treatments. 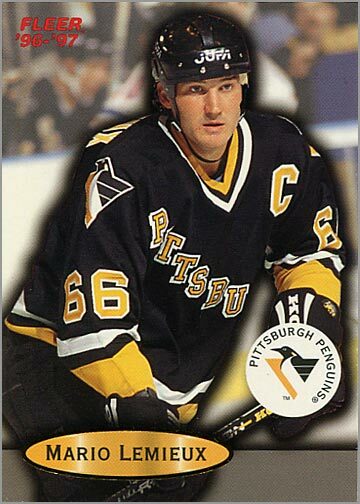 1996-97 – In what originally appeared to be his final season, Lemieux scored 122 points (50 G, 72 A) in 76 games, winning his sixth and final Art Ross Trophy. After the playoffs, Lemieux retired. November 17, 1997 – The Hockey Hall of Fame waived the mandatory three-year waiting period, and inducted Lemieux into the Hall only seven months after his retirement. 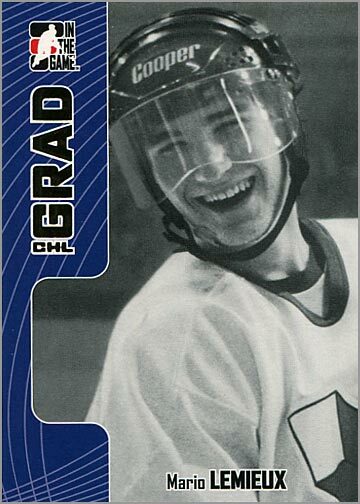 Since Lemieux was now retired, he could not be included in any hockey card set. However, trading card company Pacific did something unusual. 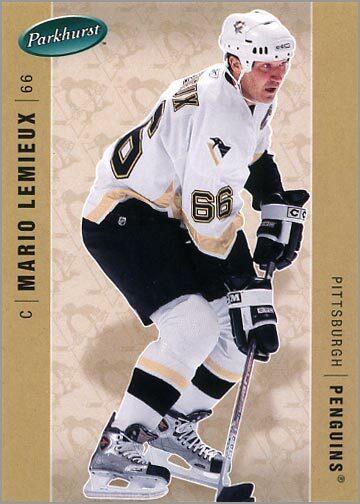 To honor Lemieux, they did not issue a card number 66 in their 1997-98 and 1998-99 trading card sets. November 1998 – The Pittsburgh Penguins declare bankruptcy. September 1999 – Using $20 million of the $32.5 million that the team owes him in deferred salary payments, Lemieux purchased a controlling interest in the Penguins. He did this to keep the Pens in Pittsburgh. 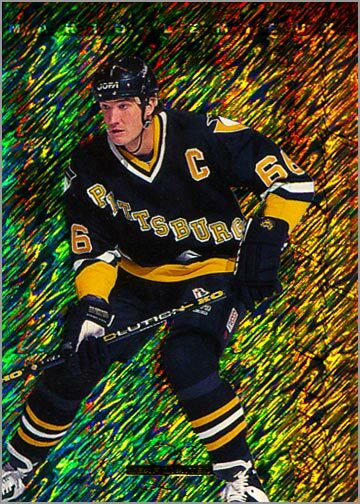 December 27, 2000 – Mario Lemieux makes a comeback, returning from retirement after a three-year absence — partially because he missed playing, but also because he wanted his son Austin, then four years old, to have a chance to see him play. Just 33 seconds into his first game back, he assisted on a goal by Jaromir Jagr. He finished the night with one goal and two assists. Lemieux scored 35 goals and 41 assists in 43 games during the 2000-01 season. 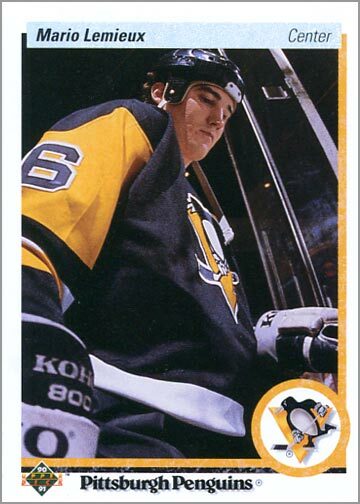 2001-02 – Unfortunately, Lemieux’ second stint in the NHL was also not injury-free. 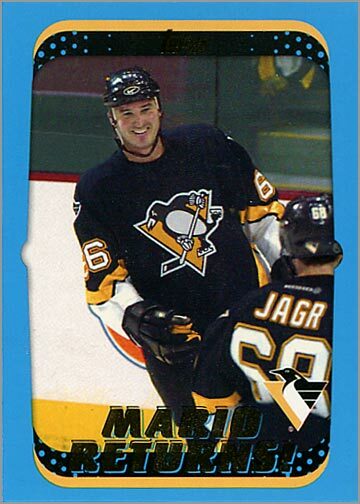 He played in only 24 games for the Penguins in 2001-02 due to a hip injury, scoring a “not-too-shabby” 31 points. He skipped some Penguins games so he would be healthy enough to play in the 2002 Olympics, as it would be his only shot to play in the Games. Lemieux captained the 2002 Canadian Olympic Team to a gold medal, scoring two goals and four assists in five games. 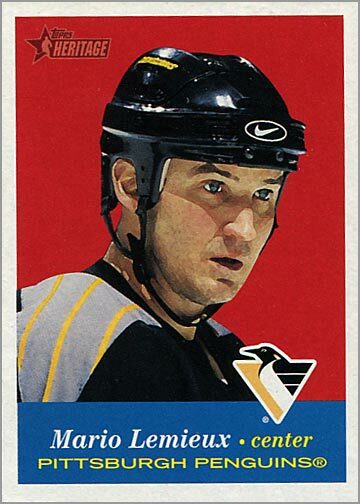 2002-03 – Lemieux led the NHL in scoring for most of the season, but again was injured and finished eighth overall. He put up 28 goals and 63 assists for 91 points in 67 games. This was the last time he would play close to a full season. 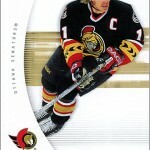 2003-04 – Lemieux was limited to just 10 games of action due to a hip injury, and scored one goal and 8 assists. 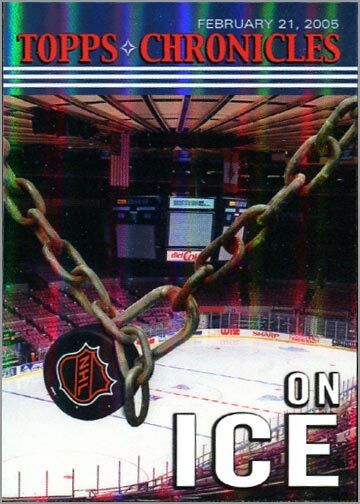 2004-05 – The entire 2004-05 NHL season was cancelled due to a lockout. 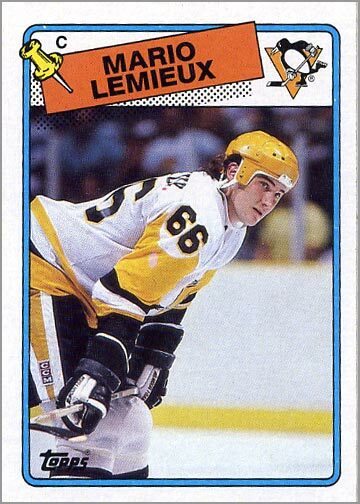 Unlike other NHL players, Lemieux did not play for a minor league team or a team in Europe. 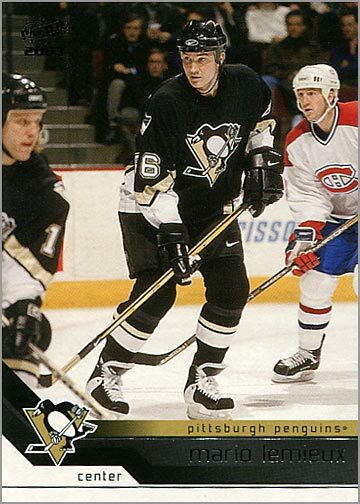 2005-06 – In his final season Lemieux scored 22 points in 26 games. 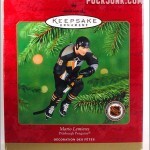 December 16, 2005 – Lemieux played his final game. 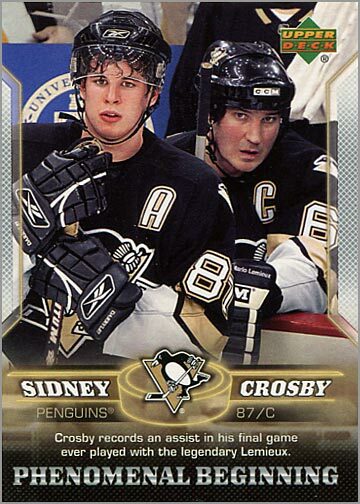 In a “passing of the torch” moment, he and Penguins rookie Sidney Crosby both assist on a goal by teammate Ziggy Palffy. This was Lemieux’s final point and his final shift. January 25, 2006 – Lemieux retires for a second and final time, He struggled with atrial fibrillation, which gave him an irregular heartbeat that required medication to regulate. He also felt that he could not play at the level he wanted to. 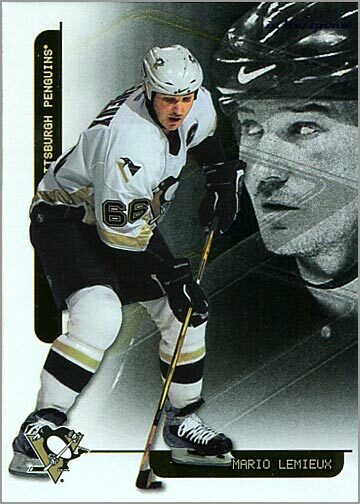 When he retired for good in 2006, Lemieux had scored 690 goals and 1033 assists for 1723 points in 915 games. March 13, 2007 – Lemieux’s ownership group reaches a deal to have the Consol Energy Center built. As part of the deal, the Penguins will remain in Pittsburgh for another 30 years. 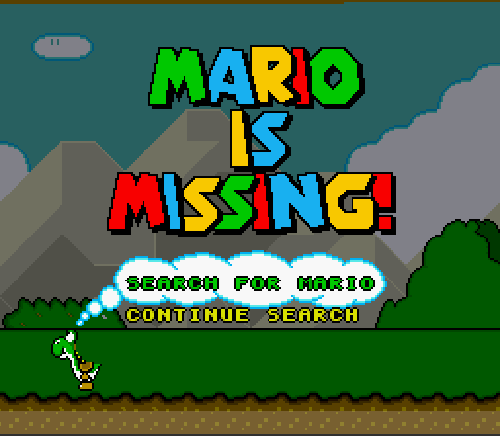 Excellent tribute to Mario! He was certainly the player I grew up looking towards (including following his career as in infant in Edmonton during the Gretzky years!) and was someone I looked up towards during his fight with cancer, back spasms and the ownership situation. 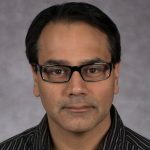 He was the guy I was while playing road hockey or the player I took while playing NHL 94 and the player who’s poster hung in my room and it was well earned. December 27, 2000 was certainly one of the best days of my childhood – can anyone (without help from Uncle Google) tell me who the Penguins beat that night? Toronto Maple Leafs 5-0. That game was well anticipated here in T.O. I even knew even strongly for many days beforehand predicted Lemieux would have a point within the 1st 30 seconds. What’s interesting is if I wear my pimped up Stanley Cup 1992 Lemieux jersey, it’s all compliments from Leaf Nation. If I wear my final season Lemieux jersey, people usually assume it’s a Crosby, Malkin, Kessel or someone on the current team and I get the weird looks and odd snidely remark. Until they see thee 66, then the Lemieux and suddenly they chill out. Yeah I remember it for two reasons – 1 I was living in Trenton at the time and going to high school so it was a big deal and 1 – my brother is a Leafs fan and let’s just say I thoroughly enjoyed that night while he was very tormented. Funny you should mention about your 92 Lemieux jersey – I got a pro replica of the same 92 playoffs jersey a few years ago (same size and all) and found I have received the same amount of attention and interest in it. I mean it’s a beautiful jersey, but people love to ask about it, especially Leaf fans. For example, I was at a private meet and greet with Don Cherry in Ottawa here a few years ago and the event photographer (leaf fan) thought it was fantastic and wanted a photo. I also wore it in 2008 when the Pens played the Sens in the playoffs and caught game 4 for the sweep. All us Pens fans paraded out with brooms and signs and chants and sure enough, out front there was a large group of Leafs fans there to greet us and rub it in to the Sens fans leaving (probably more the rivalry between the teams than the Pens, but I’ll take it). Since then I’d say 95% of the Leafs fans I know (mostly folks in the Ottawa Valley) have a soft spot for the Pens and sort of adopt them as their playoff team (Given how the Leafs haven’t been there in awhile). That said, I wear my Mario jersey in downtown Toronto and I guarantee I’ll get thumbs up. 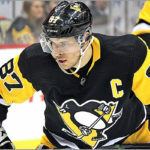 I think a Crosby would be more the same at the moment given the situation, but I agree, Leafs fans are less appreciative of the modern Penguins stars than Lemieux (or possibly Francis although that could be more because he is a former Leaf and a stand up bahd). 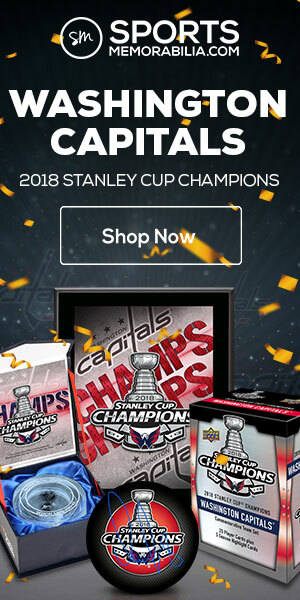 I think it’s about the big names on the different Pens’ teams. Crosby is seen as a crybaby, which no one outside of Pittsburgh likes I’m sure. Lemieux not, because we’re rightly so wowed seeing someone scoring 5 goals in a game 5 different ways then beating cancer and winning Olympic gold. Even with the likes of Rob Brown on one of those teams and not many liked Rob Brown outside of Pittsburgh. Yeah you could be right. Lemieux was easily a generational talent and the things he battled through should earn the respect of anyone. I just wonder if people will still have the same perspective of Crosby after he’s been retired 10 years+. Nostalgia has a tenancy to shade things a different colour. As for Rob Brown – I suspect you’ll have a hard time finding anyone on the streets of Toronto who even know who he is! 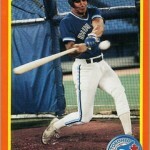 I wish you’d use Mike Bullard instead as I am confident most would confuse him with the Newstalk 1010 radio host lol.